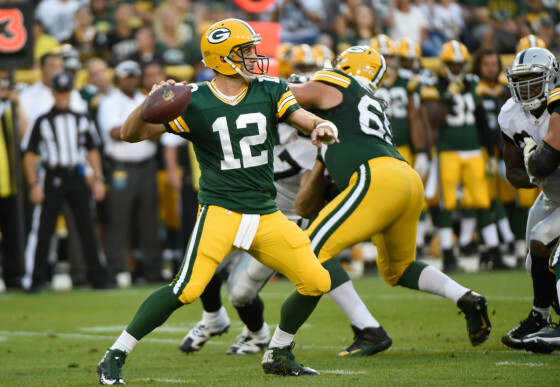 Tag Archive | "2018 NFC North Preview"
This division should be nip and tuck the whole way between the Packers and the Vikings, and I see the Packers coming out on top. The reason for this is very simple and that is Aaron Rodgers. Green Bay still does not have much of a running game to speak of, and the departure of Jordy Nelson leaves them with fewer weapons on the outside. Geronimo Allison will have to pick up a bulk of that slack for this team to be successful. Josh Sitton will certainly be missed off the offensive line, but Aaron Rodgers has figured out ways to get around a shaky offensive line for years now. I think the defense will be stronger than it has been in previous seasons. Muhammad Wilkerson can be a dynamic player when focused, and I feel he will be looking to prove doubters wrong this season. Kevin King coming into his second year at cornerback will make strides into the upper tier of corners in the league. Ha Ha Clinton-Dix is still a productive player at safety as well. At the end of the day, this team will go as far as Aaron Rodgers takes them, and I will take those odds. The Vikings will attempt to respond after yet another terrible performance in the NFC Championship game, and they went all in on Kirk Cousins to make that happen. Cousins is on a very lucrative, top heavy (guaranteed) three year deal which would indicate the Vikings are looking to make a run here in the immediate future. I would like to see if Adam Thielen will be as productive with Kirk Cousins as he was with Case Keenum. Those two had what I thought was a special rapport last season, and I don’t know if that will carry over. Dalvin Cook returns from injury this season, and if he is right health-wise, he can be a dynamic playmaker. As usual, the Vikings will be strong on all three levels of defensive. Sheldon Richardson (much like his former teammate the aforementioned Muhammad Wilkerson) is highly productive when focused, and they will need him to fill the role left by Sharrif Floyd. Danielle Hunter and Everson Griffin are very underrated at the defensive end positions as well. Anthony Barr is a spectacular linebacker, and their secondary is deep and good at all positions. Andrew Sendejo and Harrison Smith are top end safeties, and the corners of Trae Waynes and Xavier Rhodes are elite as well. Terence Newman is still a perfect nickel at his age. I’m just not sure if everything will come together for the offense again this season like last year. I think Detroit has successfully wasted Matthew Stafford’s career. They will once again be bringing in a new coaching staff. While Matt Patricia certainly has the pedigree of being a Bill Belichick protege, Jim Caldwell was getting the job done in Detroit, and I don’t like starting over with a defensive coach for Matthew Stafford at the age of 30. They will hope that, at the age of 30, LeGarrette Blount will be able to solve their running back situation, but it’s dangerous to rely on a 30 year old back, especially when they have taken the hits that Blount has in his career. The Lions have a lot of reliable wide receivers but no one who will burn you, and the line is okay and led by Taylor Decker (Tackle) and T.J. Lang (Guard). Ezekiel Ansah has appeared to have finally come into his own and will provide a productive pass rush this season, and the secondary is again anchored by Darius ‘Big Play’ Slay. It will be interesting to see what improvements Jarrad Davis has made to his game entering his second season at linebacker. The Lions are by no means a bad team, but they will once again not be able to make late season noise despite having such a quality quarterback. It’s tough to gauge exactly what the Bears will be this season, because there is no way to know exactly where Mitchell Trubisky is coming into his second season. Trubisky didn’t get many starts in college and did show instances his rookie year that give the indications he has the tools to be a good quarterback. The only issue I see here is that the Bears were treating Trubisky more like neonatal then kid gloves last year. The offense was consistently watered down to bring Trubisky along. Clearly things will change as they now bring in offensive minded Matt Nagy as head coach to replace the accomplished but very defensive-minded John Foxx. Jordan Howard should continue to improve in his third season and gives them a nice weapon out of the backfield, and let’s see what Allen Robinson can do at receiver coming back from injury. I like the two former Bulldogs on the defensive side of the ball. Leonard Floyd has struggled to get his career off and running because of an injury as a rookie, but I think in his third year he will really flash onto the scene. I really liked rookie Roquon Smith in the draft, and he very well may be the next in the distinguished list of Bears middle linebackers. The secondary I do have some concerns with. Prince Amukamara is only average at cornerback, and while Adrian Amos is a quality pro, they are definitely a little shaky on the back end of their defense. We should see within the first couple weeks where Trubisky is at in his progression and that will be a better indicator of the type of team the Bears will be for the rest of the season.